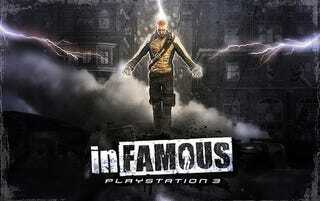 Sony Pictures is working out a seven-figure deal with producers Avi and Ari Arad and screenwriter Sheldon Turner to bring the PlayStation 3 exclusive inFAMOUS to the silver screen. According to The Hollywood Reporter, Turner pitched the movie to Sony Pictures, which pre-emptively caught it, and the studio is now working out a deal for rights to adapt the game into a major motion picture. The Arad's are set to produce, just as they are producing the Uncharted: Drake's Fortune feature film. As for Sheldon's take on the game, his comments are nothing if not heartening to fans of the Sucker Punch-developed, free-roaming superhero title. "What excited me most about the game was it was the first of which I've come across that had a big idea and a character arc," Turner said. "It is, I believe, the future of gaming. The game, while big and fun, is at its core a love ballad to the underachiever, which is what our hero, Cole McGrath, is." An underachiever who turns himself around rather quickly, but he certainly seems to have a firm grasp. Between that and the fact that the main character is so bland that any actor with a shaved head can play him, and we might have a winner here.